The Cutbow Trout is a half breed by the standards of ANY other species on earth! Half rainbow trout, half cutthroat trout, all goodness through and through! Well, to be honest with you, there really is not a lot of info out there on this fish. 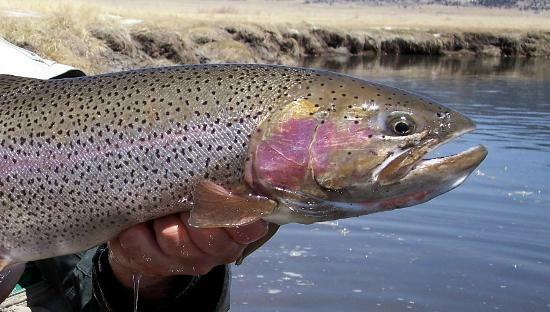 What we know is that cutbows are a hybrid of rainbows and cutthroats. They can be found in any area where the two species can come into contact with each other. Rainbows have a much wider range, so we can intelligently (?) say that the limited living area of the cutthroat is much more likely for the cutbow. That would be the western one-third of the United States including Arizona, Colorado, Nevada, California, Utah, and Montana among others. Being the hybrid that they are, these fish are a silvery grey in color over most of the body. They have both the characteristic "cutthroat" mark under the lower jaw AND the horizontal red band down both sides like the rainbow. As far as size goes, these get pretty large. Although the average size is not recorded anywhere that I can find, the Colorado state record is a whopping 18.8 pounds at a little over 29" long. If that is a STATE record, it is open to the imagination what a world record might be! In the same vein, the average size would probably be somewhere in the 15 to 20" length, 20 pound area. As far as the life cycle, it is also a hybrid. Spawning is in the late fall with the eggs hatching the following spring. 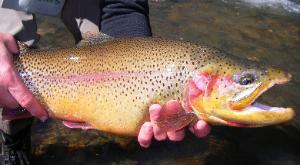 Female cutthroats or rainbows dig the redds and deposit the eggs. The males (either species) fertilize the eggs readily. Since they are both present in the same streams, the cross breeding is almost inevitable. 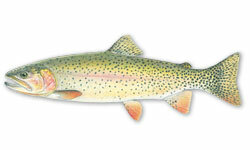 Cutbow Trout are aggressive eaters and will eat whenever the opportunity presents itself. Like any trout residing in still water or slow running streams, they will take insects, terrestrials (grasshoppers, ants and even mice! ), small crustaceans and in some cases, other smaller fish. They aren't shy, my fellow angling troutmongers! These fish will hit your lure FAST and run like the wind, taking your line to the maximum length. Expect acrobatic jumps and splendiferous antics as they try to get off your hook! Cutbows do not like being caught! Use your favorite trout recipe on these meaty marine meals. Baking, broiling, smoking, sautéing, and deep frying are all good preps for this species. As always, a little lemon and some cooking wine or Grand Marnier adds to the flavor. By far, the most tender way is to use a lemon butter marinade, and broil the meat slowly about 3 to 4 inches from the flame. These fish more closely resemble a rainbow than a cutthroat, boys and girls. The only REAL way to know the difference is to look at the "spottiness" of the fish. Cutbows have more spots than their flamboyantly colored cousin. Don't be fooled by the cutthroat mark on the jaw either.